Position the interior lining (EVA floor tile piece) on top of the thick bar handle (half of the PVC pipe) with the rough side facing up. Push the interior lining down inside the thick bar handle. Position the lining so it's centered in the thick bar handle half. The concave shape of the thick bar handle compresses the lining and keeps it in place without the need for glue. With a pair of heavy duty scissors, cut off excess lining material that protrudes from the edges of the thick bar handle. 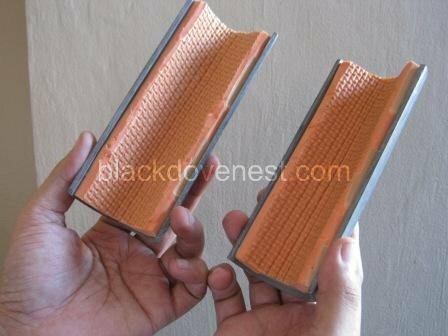 The photo below shows the interior lining inside the thick bar handles. The inside lining is held in place by compression and no glue was used. Do the above for the other halves of the thick bar handles. The material mentioned above calls for a 3/4" thick EVA floor tile, but since the tile I had was 1/2" thick, the fat grip wasn't snug enough. To make the grip tight, I added a rubber foam handle (colored blue) as shown below. 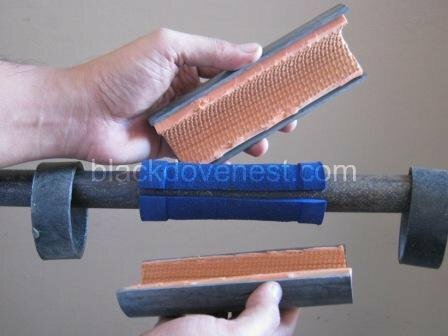 You could also use a piece of pipe insulation (where available) for this purpose. If you used the 3/4" thick EVA floor tile, you probably wouldn't need the foam handle. Pass the locking rings through one end of the barbell. This is best done on an empty bar. Be careful if you need to unload weight plates from only one end of the bar. Shown below is the foam handle affixed to a barbell bar. The locking rings were slipped through one of ends of the barbell bar. 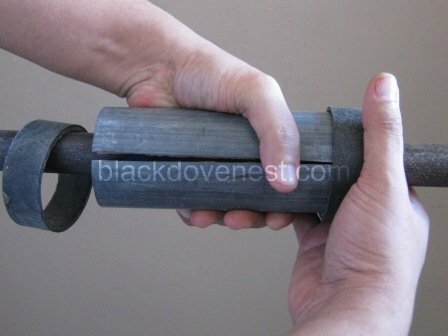 Join the two halves of the thick bar handle grips together so that they hug the bar without their edges touching. Then you need to squeeze the two halves together so that their edges touch. The two halves should now be compressing the bar tightly. While still holding the two halves tightly together with one hand, pass one locking ring on one end with your other hand as shown below. Pass the the second locking ring on to the other end of the thick bar handle. The locking rings should be snug on the thick bar handles. The thick bar handle is now securely attached to the bar. If the PVC locking rings cannot be slipped through the ends of the barbell, you can optionally use hose clamps (2") or velcro straps as locking fasteners instead of the PVC locking rings. The thick bar handles can be used in a variety of other gym and exercise equipment like the EZ-curl bar and dumbbells as shown below. 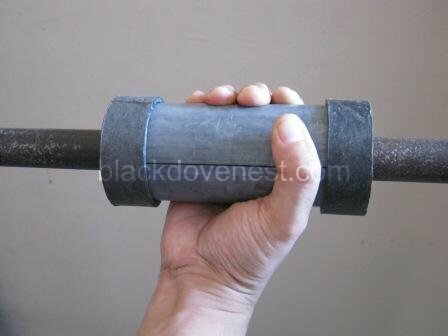 The homemade fat grips can be used in practically all other gripping equipment like chinning bars, pull-up bars, and even grip bars used for dipping. Here's a homemade dip station where the thick bar handles were fastened. If you miss the knurling on the regular barbell or dumbbell bars, you could coat the homemade thick bar handles with a non-slip paint to prevent the fat bar from easily slipping from your hands. See how you can coat the handle with a DIY anti-slip paint for a stronger grip. This list is growing, so be sure to come back! 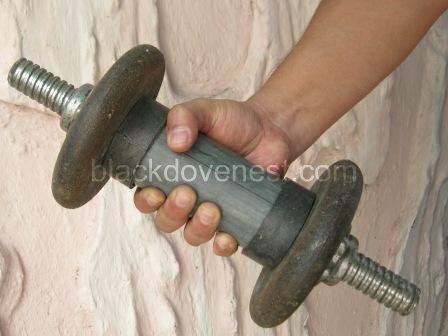 Does the fat grip spin or is it fixed/secured onto the barbell? If there's enough packing material (foam and EVA) inside the pvc, it becomes tight and therefore won't spin. Ah, interesting. I've made my own wrist curls on some older bars. I had some aluminum oars that were broke and the handles were hollow. The design was pretty simple since the bards used older type collars. (old 70's-80's straight steel bar, collars you tightened with a hex tool). All I had to do was cut the length of the aluminum and slide it over then color the bar. Then I could put the weights on the outside of the collar then collar the weights. I could make it as tight or loose as I wanted with the weights spinning, the collar to spin, or all of it to spin. The idea of the spin was so I could focus on grip and not have the weight roll off my fingertips. The "sleeve" wasn't a fat sleeve and I didn't know if such were of use but thanks to your article I will try this.